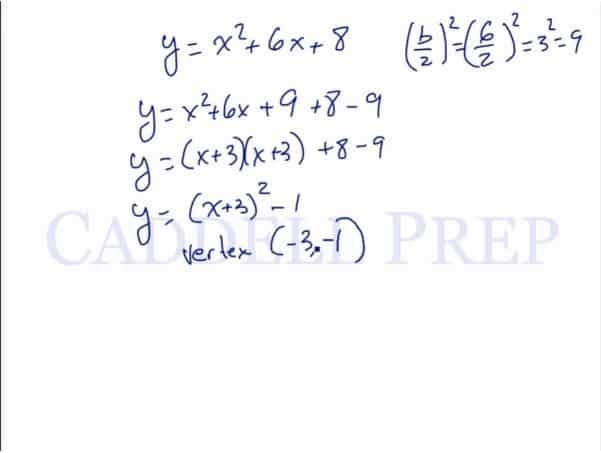 In this video, we are going to look at the vertex form of a quadratic equation. From this equation, we can clearly see that the vertex point is at (3,-4). This form is very useful in identifying the coordinates of the vertex. If we were given an equation in standard form, we can complete the square to get it to vertex form. This means that we have to add 9 to complete the square. However, if we add 9 then it changes the formula. To counteract that, we will also subtract 9. Let’s focus on the first three terms in the equation. Now, we have written the equation in vertex form. From here, we can see that the vertex is at (-3,-1). Let’s go over vertex form of a quadratic equation using completing the square. We could write this anywhere on the graph. Up, down, left, or right. Now, if we want our line to be down by and move right by , then we should also adjust the basic quadratic equation by the same number. Let’s go up by and move right by . The equation form above is very useful in finding the vertex. How do we translate this into the previous form? We can do that by completing the square. Let’s transform this into the vertex form. We want to complete the squares. Let’s just focus on the first three terms since it’s a perfect square. So now we arrive at the vertex form.